Already fully electrified, Lime Street will probably be little changed by the project. 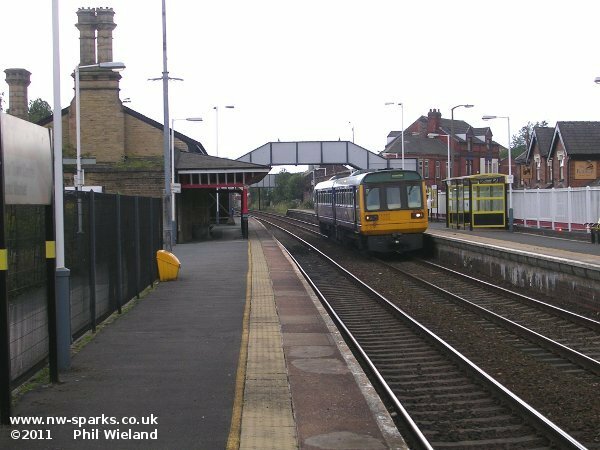 Trains to Manchester, Warrington Bank Quay, Wigan and Blackpool usually run from the lower numbered platforms on the north side of the station, and it is rare to see an electric train in these. 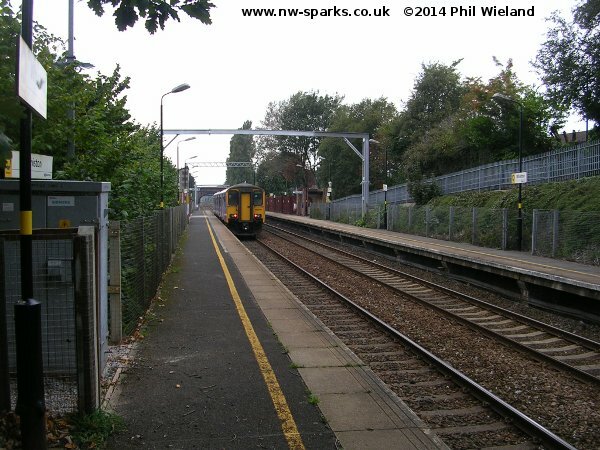 The four track railway to Edge Hill climbs steeply. It was originally rope-worked with stationary engines at Edge Hill. 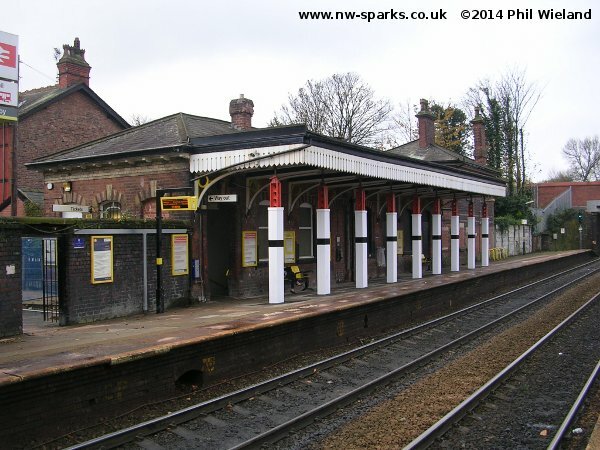 The world's oldest railway station still operating, Edge Hill is already electrified. 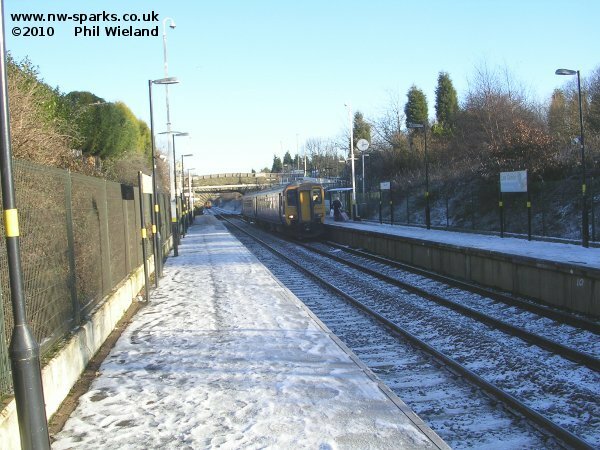 Trains on nw-sparks services usually use the northern island, platforms 1 and 2, although the track layout does allow the other island to be used at times of disruption. An arts organisation called Metal has taken over and refurbished part of the station building. There are sidings both sides of the line, and the Tue Brook permanent way yard is on the north side immediately after the station. After Edge Hill the line to Allerton leaves to the right and then the freight line to Seaforth curves off to the left at Bootle Branch Junction and the existing electrification ends. From here onwards we are on a two-track railway. This station was added to the line in 2000. After Wavertree the Olive Mount curve joins from the north. Between Broad Green and Roby new additional tracks will diverge at a location provisionally named Roby Junction. 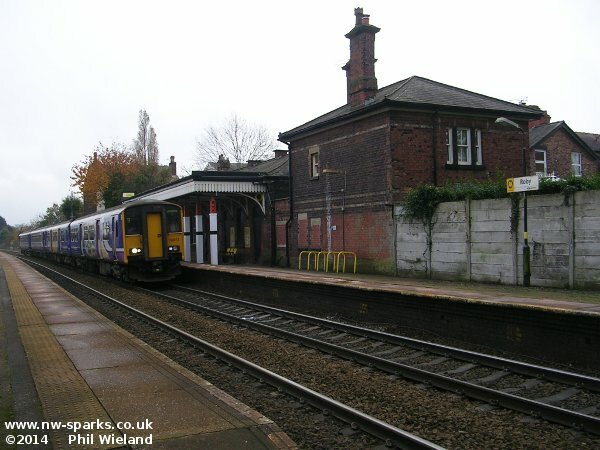 This station has always been the "little brother" to Huyton, less than a mile away. Sunday opening was only introduced a few years ago. A recent major refurbishment here has added a canopy on the Liverpool-bound platform and replaced the tatty access to the subway from the other platform. Two disused platform faces will be restored to use here as part of the additional tracks project. Three lifts will be provided. The traditional signal box controls only colour light signals, three and four aspect. The last four semaphores here were removed in September 2012. 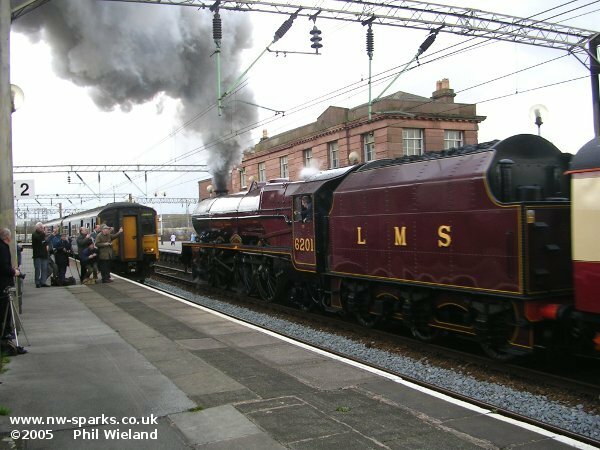 Occasionally, more unusual motive power appears on the line. At the site of the former Huyton Quarry station between Huyton and Whiston, new construction will provide a permanent vehicle access, a substation and a signalling relay room. This is a fairly recent addition to the line, opened in 1990. At the west end of the station, hidden behind the footbridge in this shot, is the first ever skew arch bridge to cross a railway, constructed by George Stephenson in 1830. The signal box standing to the east of the station is no longer in use. In the shot below, taken in April 2012, you can see that the footbridge from which I took the above picture had been demolished. A replacement has since been provided. This stop opened in 2000 a few hundred metres from the site of a previous Lea Green station. 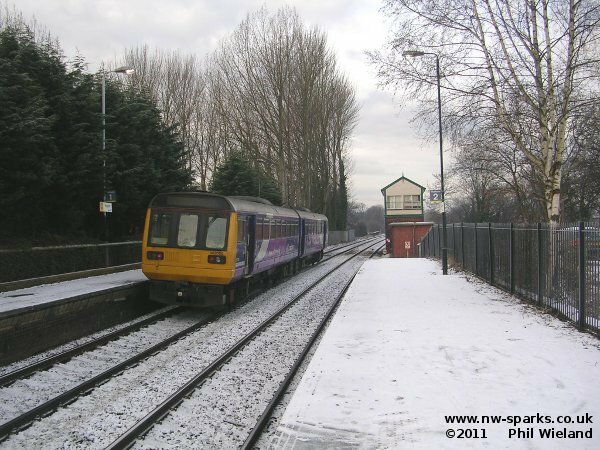 Here a Liverpool-bound Class 156 unit calls on a chilly December day. The road bridge at the far end is too low for electrification, so in 2012 the track was lowered, with slight downward slopes being added to the platforms at the bridge (Manchester) end. 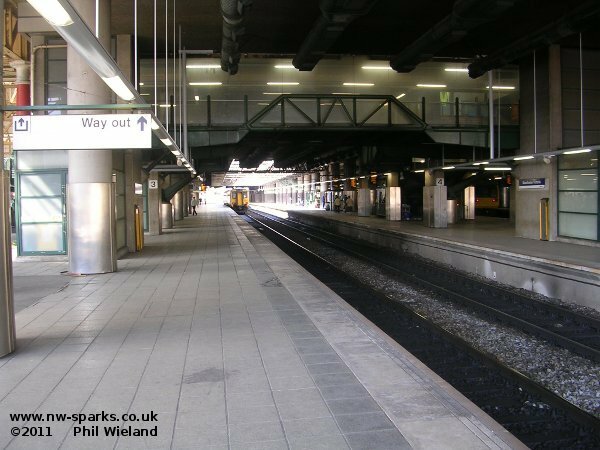 During the work temporary platform extensions were provided at the Liverpool end. Work was complete by April 2012. 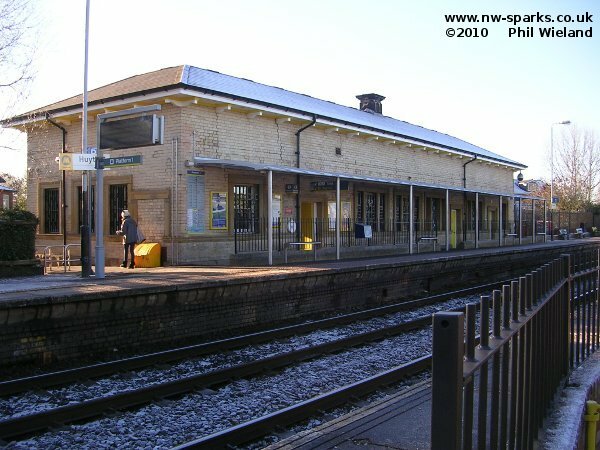 This station, located in Sutton, was the junction where passengers changed for a train to St Helens Shaw Street (now Central), which is much closer to the town centre. This unusual station is triangular, with platforms on all three sides of the triangle. The east/south curve is already wired, the east/west straight route and the west/south curve are to be electrified. This is a general view from the Manchester end, looking west. 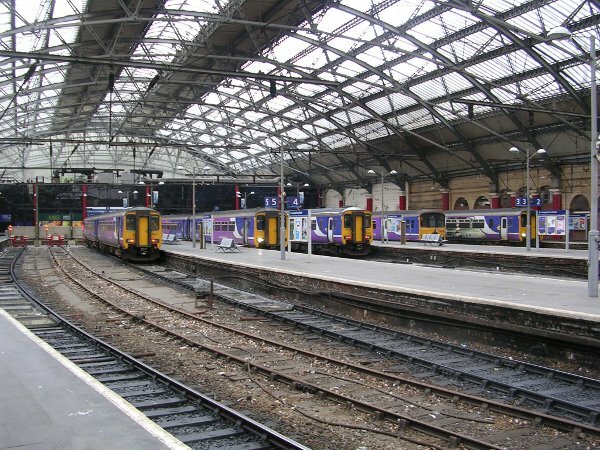 A train from Liverpool to Manchester calls at platform 1. Platform 3 is on the single line west to south side of the triangle. 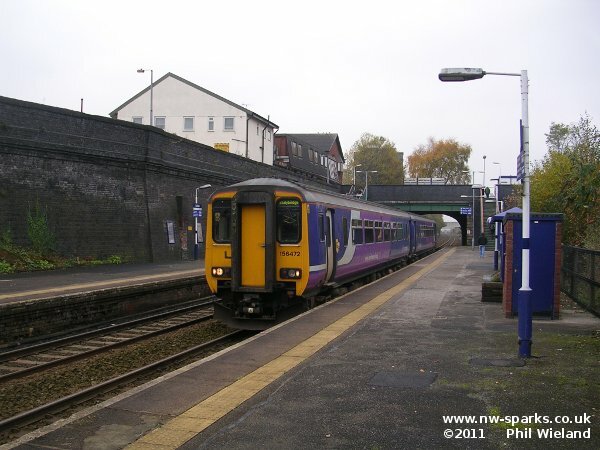 A Warrington Bank Quay to Liverpool train calls at platform 3. Platforms 4 and 5 are on the already electrified east to south curve. 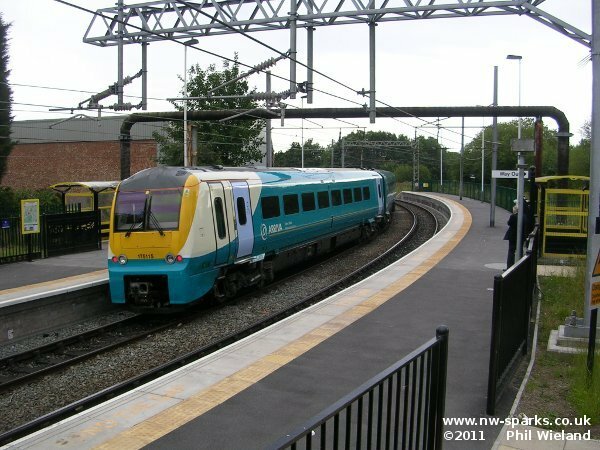 Here, a Manchester to North Wales service leaves towards Warrington. These trains will continue to be diesel worked when the nw-sparks project is completed. 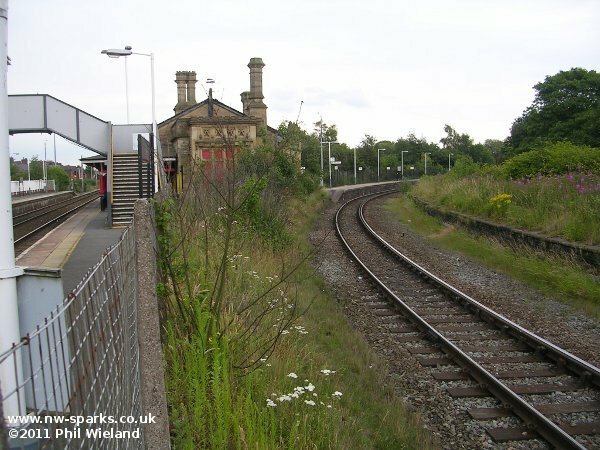 The stretch from here to Newton-le-Willows Junction is already electrified as part of an alternative route for trains on the West Coast Main Line, usually used for recessing freight trains so they can be overtaken. 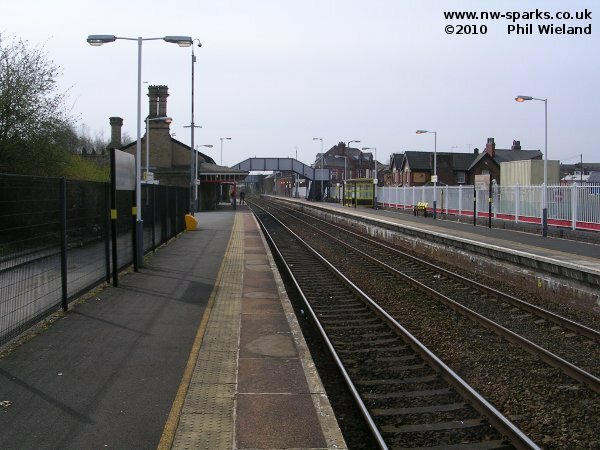 Shortly after the station is a triangular junction for the northward link to the West Coast Main Line. Looked after by Friends of Patricroft Station. 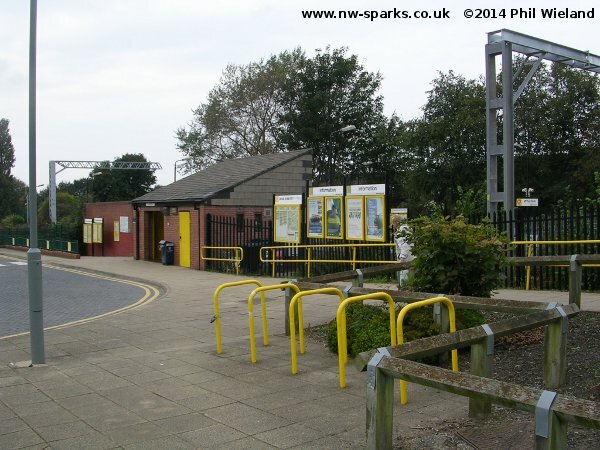 Eccles used to be a bleak station but it's now better looked after and has some colourful flower beds. 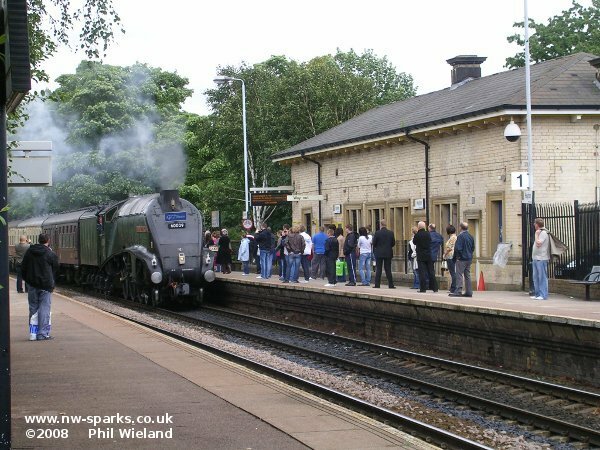 This is probably due to the influence of the Friends of Eccles Station. 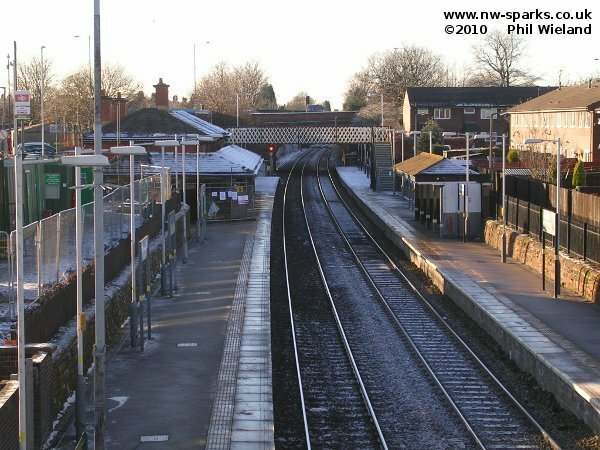 After Eccles we reach Ordsall Lane Junction where we have a choice of routes: Stopping trains from Liverpool on Mondays to Saturdays go to Manchester Victoria. 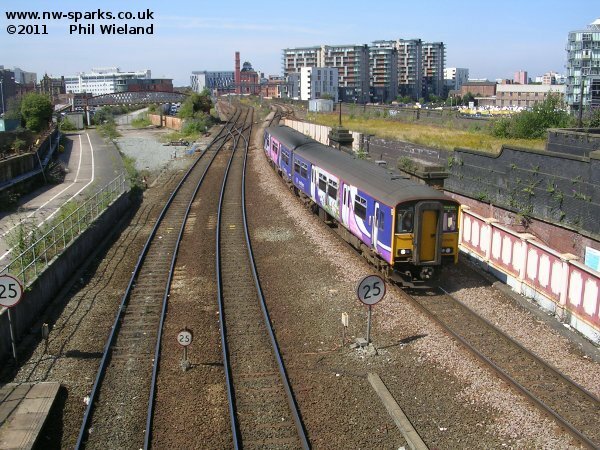 Sunday stopping trains, fast Airport trains during the week, and services from North Wales via Warrington turn right towards Castlefield Junction where they join the already electrified railway through Deansgate and Oxford Road to Manchester Piccadilly. Currently, trains to and from Liverpool pass "round the back" of Salford Central station. These lines will be moved to call at the currently disused platforms 3 and 4, and an additional fifth track and platform will occupy the current track-bed, for trains bound for the Ordsall Chord. 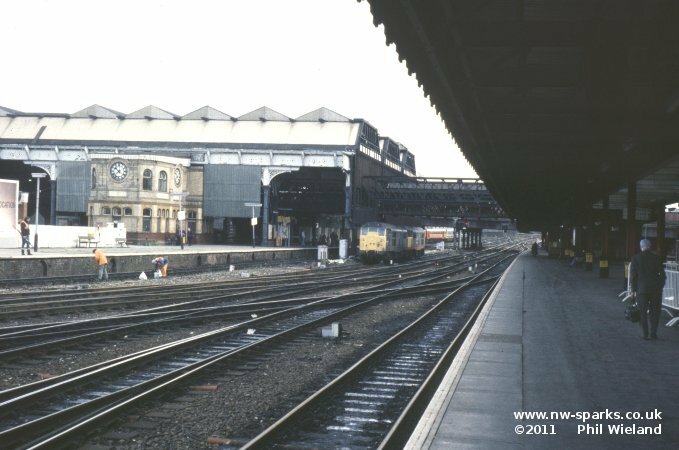 A mere shadow of its former self, and now hidden underneath the MEN Arena, Manchester Victoria will soon be redeveloped (again). 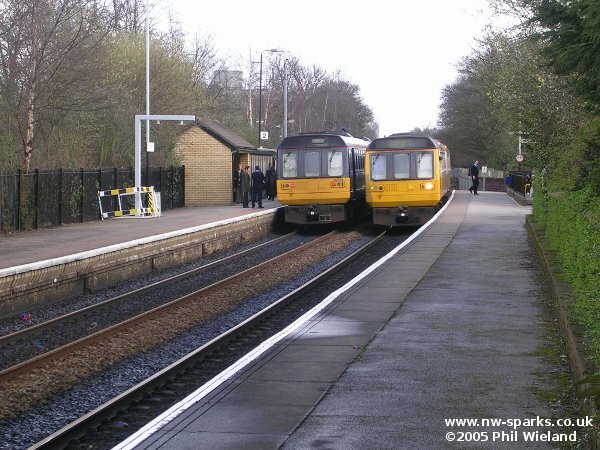 A Class 156 unit waits to form a service to Liverpool from platform 3. 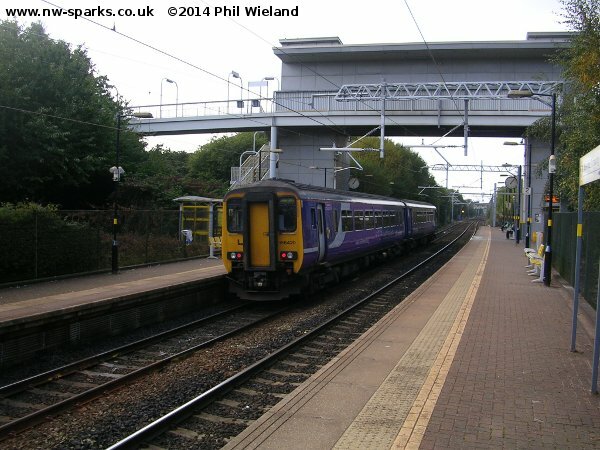 A 150 arrives from the Wigan or Bolton lines and approaches platform 5. 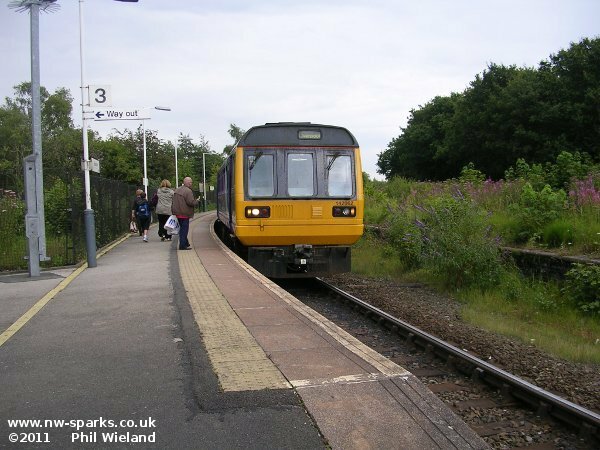 The Wigan (via Atherton) services will remain diesel worked as will those from Blackburn. 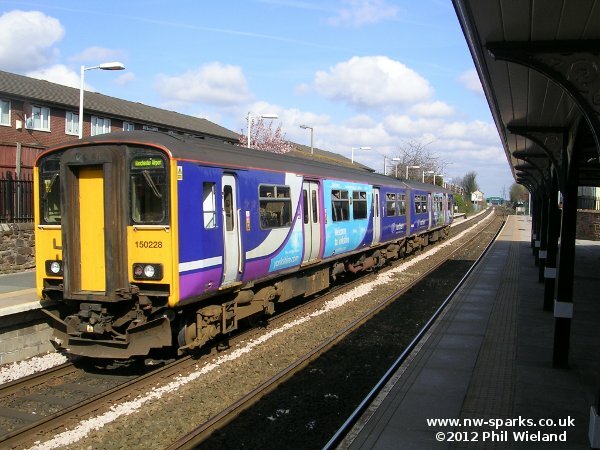 Trains to and from Blackpool and Liverpool will be electric, as will Wigan via Bolton services. 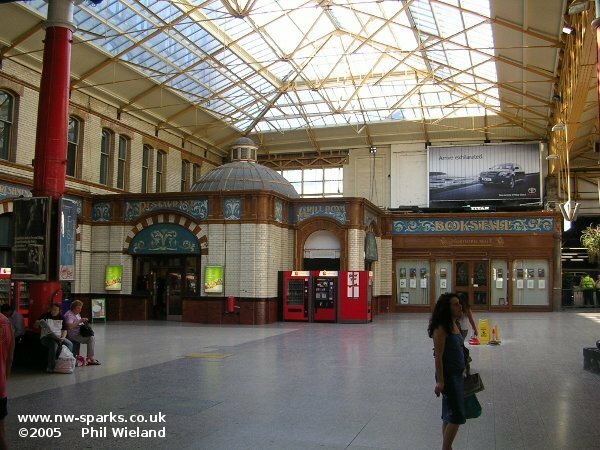 By way of a contrast, here's a shot of Victoria taken in 1990 before it was remodelled. 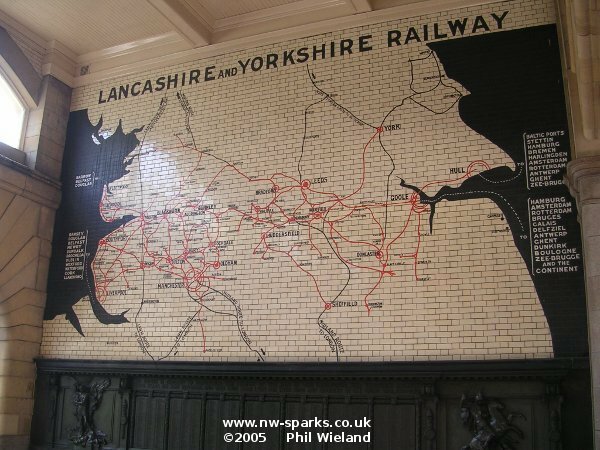 Of course, our project will not be the first electrification at Victoria, the Manchester to Bury line was operated by electric trains between 1916 and 1991 after which the line was handed over to tram services. 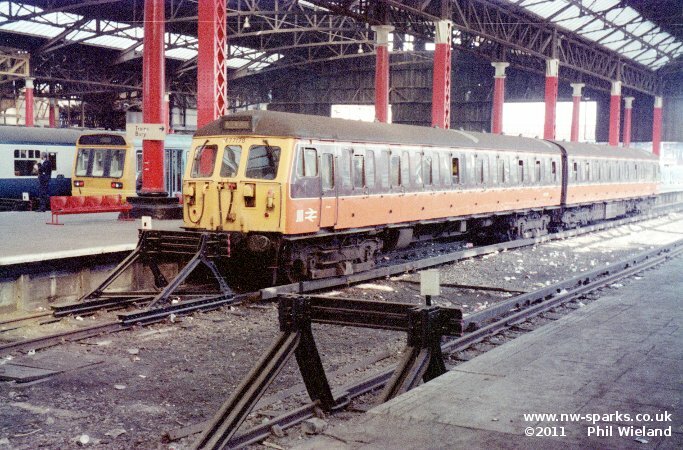 Here a Class 504 electric unit stands at Victoria on a Bury service in October 1988.